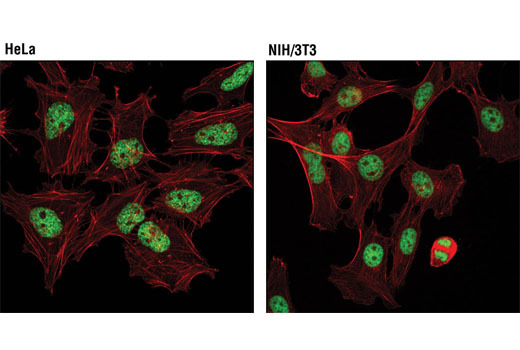 Confocal immunofluorescent analysis of HeLa (left) and NIH/3T3 (right) cells using Tri-Methyl-Histone H3 (Lys27) (C36B11) Rabbit mAb (Alexa Fluor® 488 Conjugate) (green). Actin filaments were labeled with DY-554 phallodin (red). Flow cytometric analysis of Jurkat cells using Tri-Methyl-Histone H3 (Lys27) (C36B11) Rabbit mAb (Alexa Fluor® 488 Conjugate) (solid line) compared to concentration-matched Rabbit (DA1E) mAb IgG XP® Isotype Control (Alexa Fluor® 488 Conjugate) #2975 (dashed line). 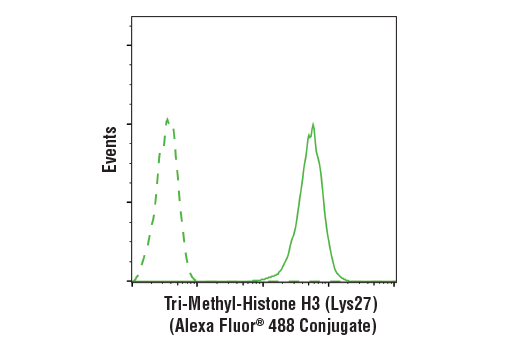 Tri-Methyl-Histone H3 (Lys27) (C36B11) Rabbit mAb (Alexa Fluor® 488 Conjugate) recognizes endogenous levels of histone H3 only when tri-methylated at Lys27. The antibody does not cross-react with non-methylated, mono-methylated, or di-methylated Lys27. In addition, the antibody does not cross-react with mono-methylated, di-methylated, or tri-methylated histone H3 at Lys4, Lys9, Lys36, or Histone H4 at Lys20. Monoclonal antibody is produced by immunizing animals with a synthetic peptide corresponding to the amino terminus of histone H3 in which Lys27 is tri-methylated. This Cell Signaling Technology antibody is conjugated to Alexa Fluor® 488 fluorescent dye and tested in-house for direct flow cytometry and immunofluorescent analysis in human cells. This antibody is expected to exhibit the same species cross-reactivity as the unconjugated Tri-Methyl-Histone H3 (Lys27) (C36B11) Rabbit mAb #9733.